This weekend’s GP2 Asia event in Bahrain has been cancelled following rising tensions in the Gulf state, sparking fears among the F1 community that the season-opening Bahrain Grand Prix may not be able to go ahead as planned. GP2 Asia was set to host its second round at the Sakhir track following last weekend’s event in Abu Dhabi, but with medical staff from the circuit re-deployed to hospitals in Bahraini capital Manama the event has been cancelled on safety grounds. Several protestors are believed to have died in overnight clashes with security forces, with demonstrators already promising to make full use of the global spotlight the F1 circus will throw on their nation. 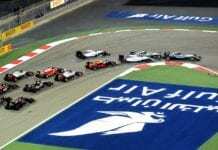 The F1 teams are set to test in Baharin in just over two weeks time, ahead of the season-opening race. FIA president Jean Todt said on Wednesday that he would ‘react without too much emotion and to face the problem [properly]” in regards to the opening G.P and the threat posed by further civil unrest in Bahrain. Next articleChina extends GP deal until 2017 – what do you think? It's Official: No USF1 Or Stefan GP In F1 This Year.